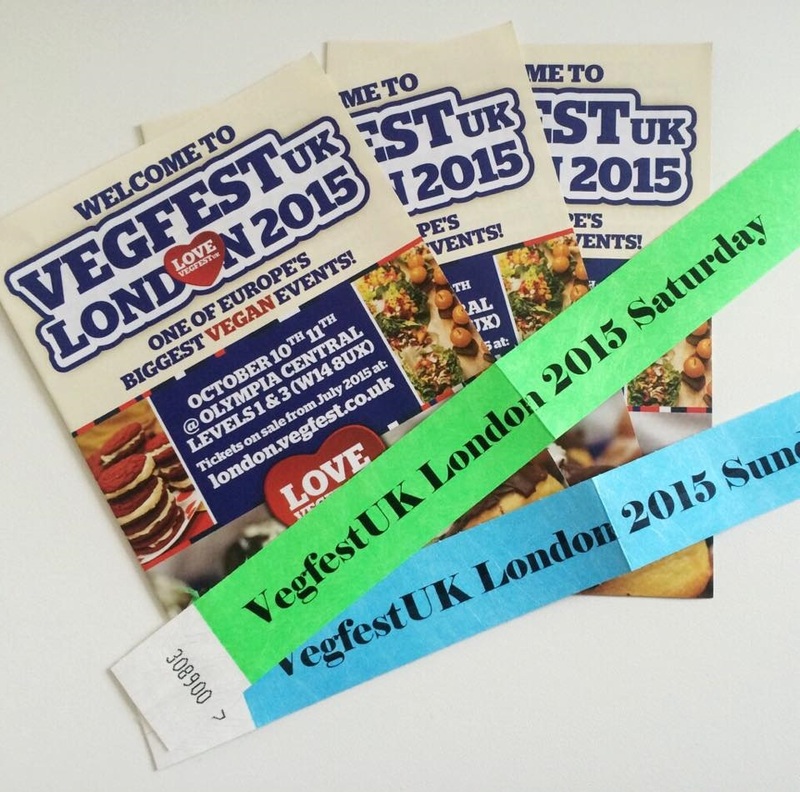 After writing a Vegetarian 101 post recently, I felt inspired to actively learn more about being a Vegetarian/Vegan, and after seeing my friend Chris’s tweet (of Hit The Floor) about Vegfest London 2015, I decided I had to go… SO, last weekend (10th October) I attended Vegfest London for the day with the lovely Lissa (Girl At The Rock Show) and had a pretty awesome time! This years event attracted over 12,000 guests spread out over both Saturday 10th and Sunday 11th at Kensington Olympia, the same location as Olympia Beauty was a few weekends ago. Despite it being quite warm and full of a few people than the room felt it could realistically fit, it was a whole lot of fun. There were samples galore, friendly chatty people and a whole lot of information about leading a Vegan lifestyle. 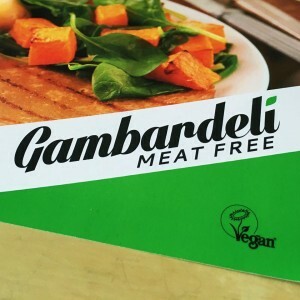 It was quite overwhelming at some points, but has *almost* solidified my thoughts on transitioning fully into Vegan over the next few months (I say almost… Cheese is the devil on my shoulder and something I know I will find very hard giving up)! I only managed to try a couple of Vegan cheeses on the day and wasn’t entirely persuaded, let me know in the comments if there are any brands I should check out! If you’re planning on doing a bit of your weekly food shop (like I accidentally ended up doing!) I would highly recommend taking along some reusable canvas bags, I was given several paper bags filled with mostly coconut milks (bit obsessed) and my hands/wrists/nooks of my elbow ended up quite red and sore. I was not prepared! Check out the picture below of the tasty things I brought home with me! 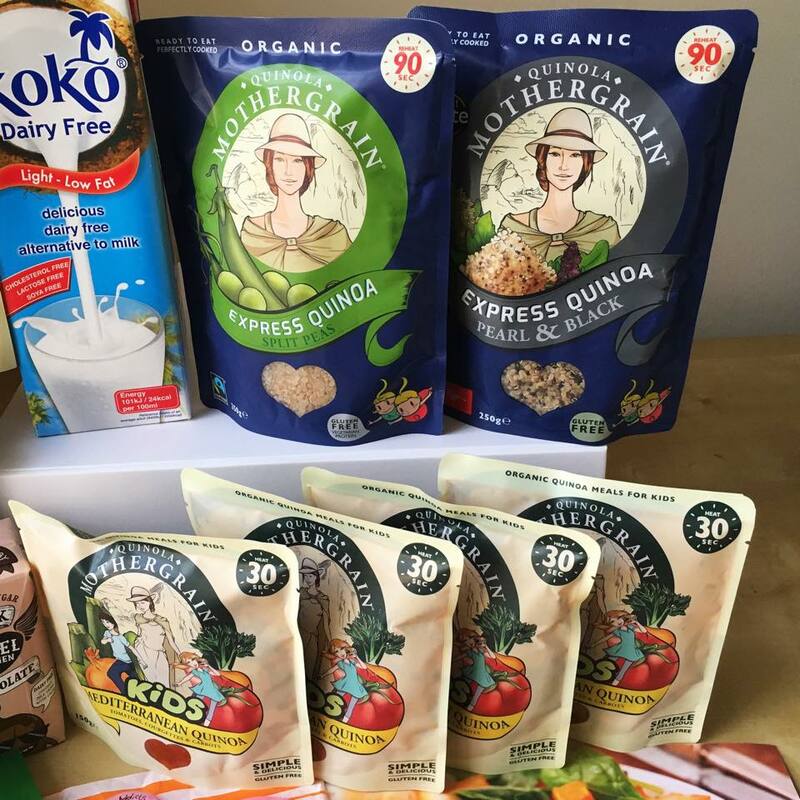 This brand is run by a friend called Lou, and I always love seeing her posts about AGNG in my feed – so was really pleased I was able to visit her stall at Vegfest! The name/branding is great and all the prints are cute and edgy! An item that caught my eye a few times is a tote bag that came in black and white and said “you can’t love animals and eat them too” with a pretty lady cuddling a lamb (£10) ! Most items available are monochrome with a splash of one colour on the accessories. 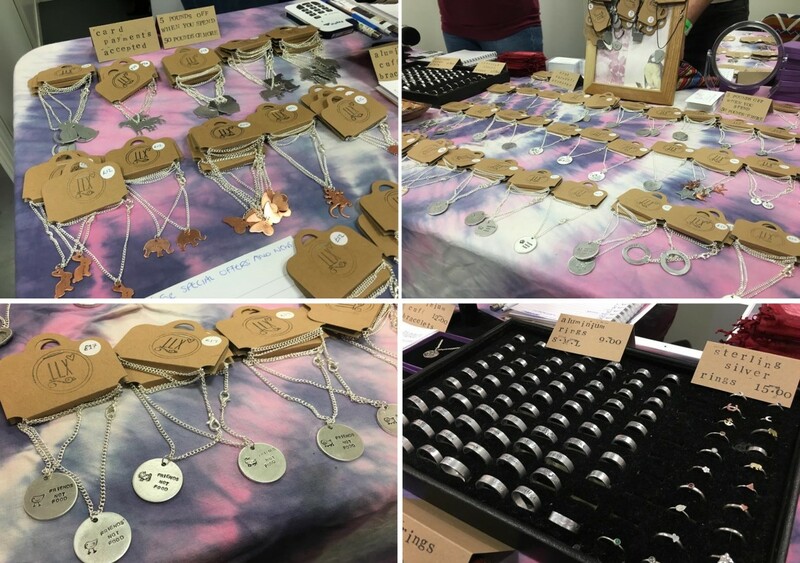 As well as clothing and tote bags, AGNG does adorable necklaces with different words relating to Veganism on them. 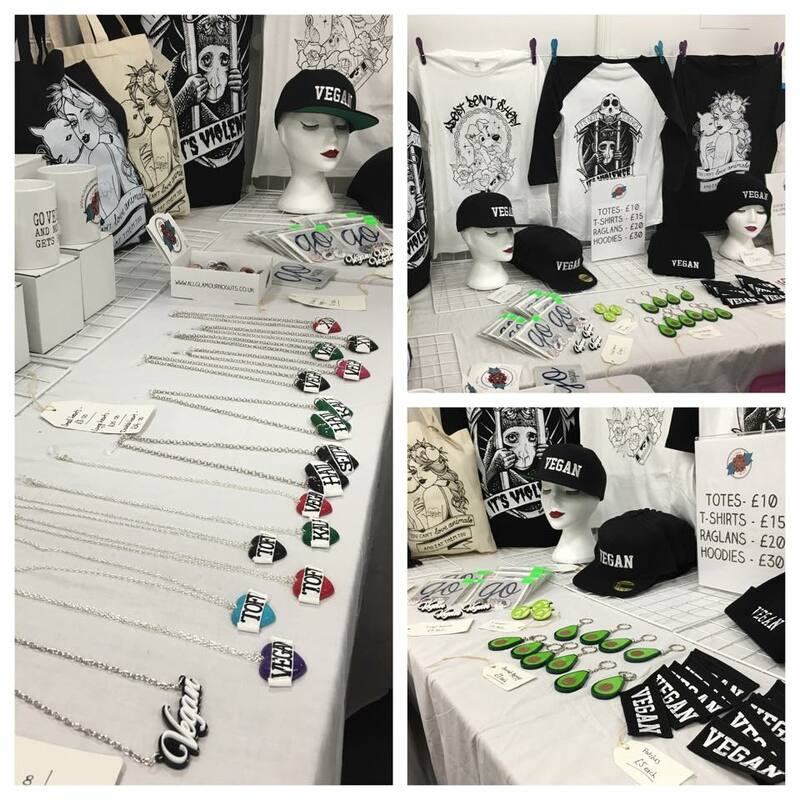 Lou actually made a prototype saying “Vegetarian” (similar to the black and white ‘Vegan’ necklace (£10) in the bottom left picture) which I am very excited to say is on it’s way to me now! 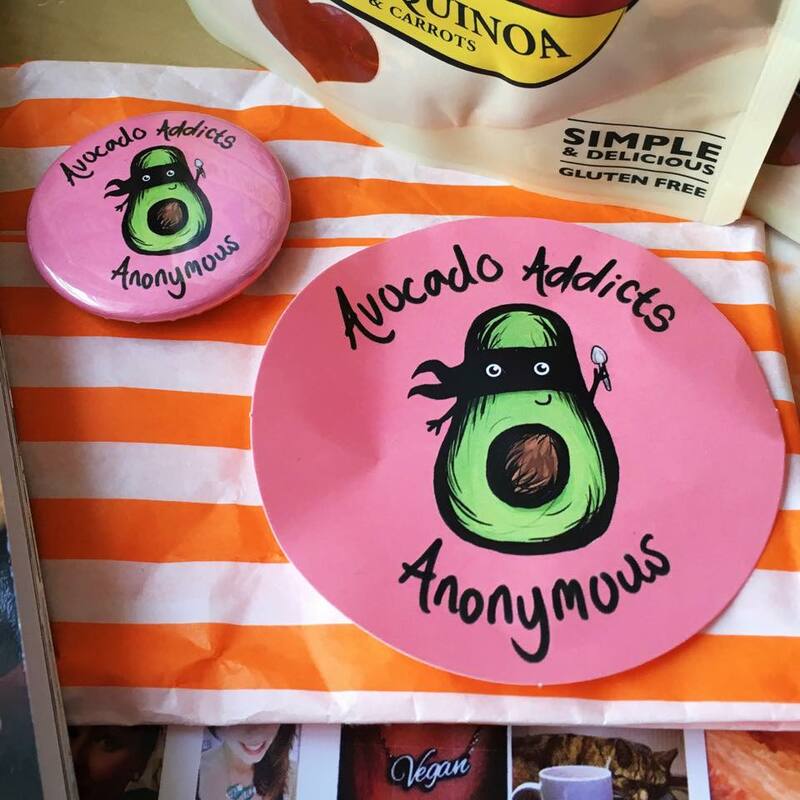 Another product I was loving, was the little avocado key rings (£8) – as a fully fledged member of avocado addicts anonymous (I’ve even got a badge, you can see it further down the page!) this is definitely something I’m hoping to get my hands on soon! 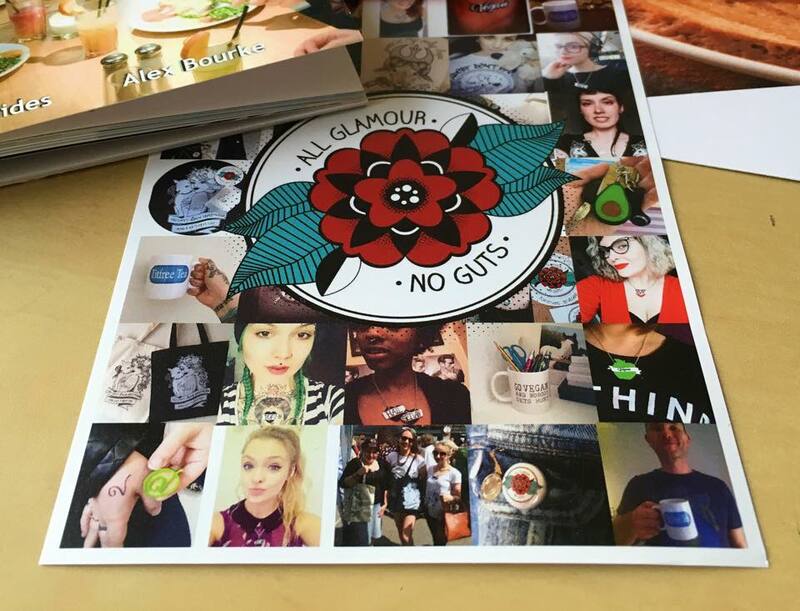 Last but not least, I absolutely love that the flyer is full of selfies/pictures taken by people who have actually bought items from AGNG. I think this is so much nicer than models posing awkwardly in promotional material! Let me just start by saying… This guy was awesome! When you walk past a stall and the owner is casually playing some Navajo flutes, you know it’s time to stop rushing around sampling lots of weird and wonderful types of dairy free everything, and just listen and appreciate. 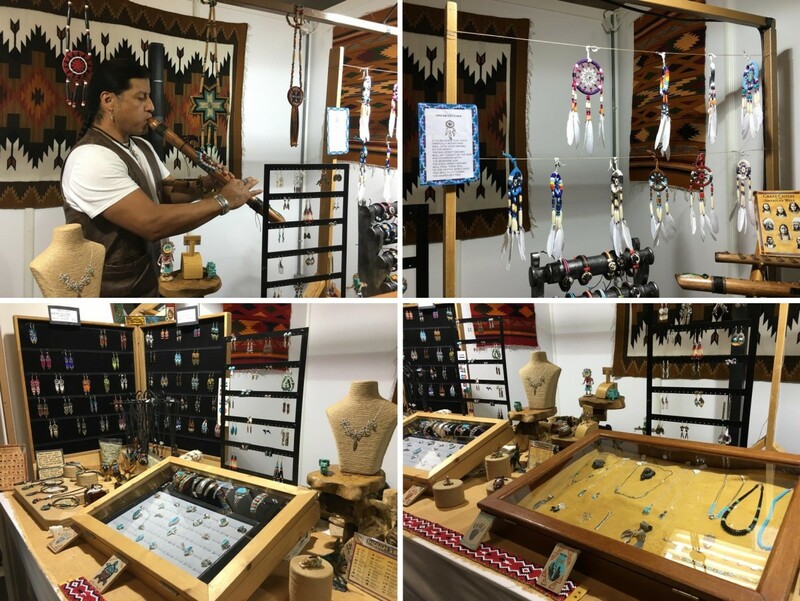 It was wonderful to see all of the authentic handmade items, including jewellery and dream catchers, all made from natural and recycled materials. There are so many difficulties in society at the moment, with a lot of people only just starting to learn and understand the issues with Cultural Appropriation (eg. people thinking it’s okay to “dress up” as a cultural minority as their Halloween “fancy dress” outfit), so seeing this man sharing his treasures with what was mostly a white audience was really refreshing, and a lovely invitation to participate in cultural exchange – his unique stall was constantly busy and surrounded by people chatting to him and asking about the beautiful products! You can find more information about Navajo Indians and their culture here! 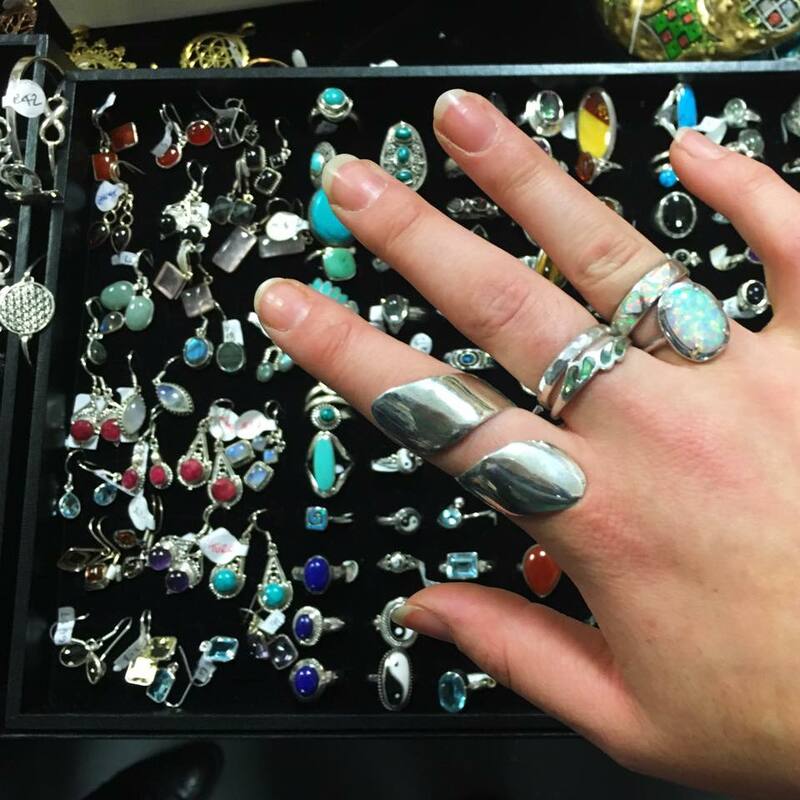 If you know me, or have read my previous Olympia Beauty post, you will know I am very much like a magpie – I love sparkly things, jewellery especially and rings in particular! So I was very excited to come across this stall. There were rings galore and I’m always looking to add to my sterling silver ring collection. This is probably going to sound very silly (and incredibly uncool), but a while back I decided I wanted to be one of those people that wore lots of rings, but I didn’t have many to start with. I knew I didn’t want generic ones that everyone else could buy on the high street, so in countries I’ve visited and towns I’ve been to I’ve always looked out for rings and I have quite a nice collection now… On my middle finger are 2 rings – the powershell from Glastonbury and matches one my friend bought too, above that a ring from the Laines in Brighton, and on my 4th finger two rings with moonstone (I couldn’t decide which to buy) that I found in a cute little jewellery shop in Sofia, Bulgaria when visiting my dad over Easter this year. The beautiful silver one that wraps around my second finger in the picture below I picked up from Equinox and is my most recent purchase! Equinox also have a therapy centre in Wolverhampton, you can find out more information here! When we came across this stall, both Lissa (Girl At The Rock Show) and I stopped and looked at all of the items for ages. The designs are simple, and clearly made with a lot of love. Made from eco-friendly fine silver clay and ethically sourced natural gemstones. You can also get custom paw print pendants made, which I think is just the cutest idea! Check out their Etsy shop for more info, prices start at £41 + postage. My absolute faaaavourite thing on the stall however, was this little guy. 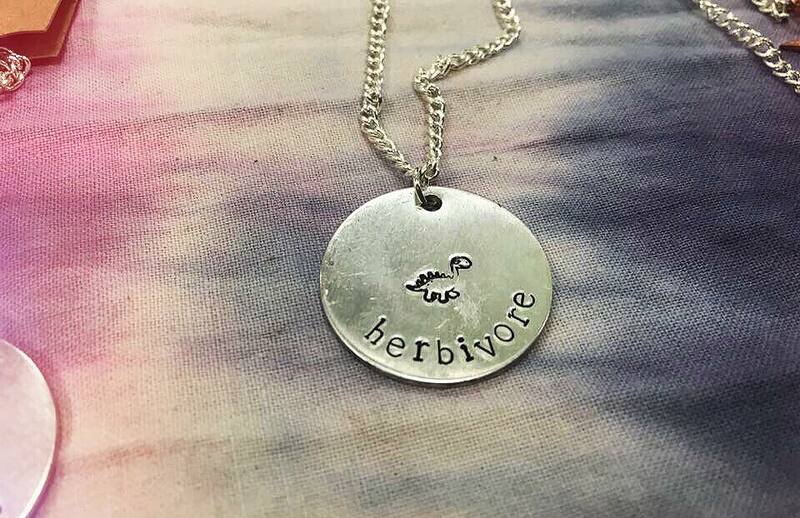 A dinosaur necklace (£14) with “herbivore” printed underneath, how incredibly cute is he? Koko is a brand I’m already familiar with (and a fan of!) because I use dairy free milks (such as coconut, rice and almond) in my Juice Plus shakes every morning! Usually I try to avoid things with: light, low fat, or fat free on (because it always makes me wonder what they have replaced the “fat” – usually lots of chemicals and highly processed things which are harder for our bodies to get along with)… However these were £1 a carton (or less, I can’t remember) so I had to buy a couple of cartons to stock up! They were also giving out tasters of their other flavours. As a milk on it’s own, even flavoured are quite mild in my opinion, in contrast to the Rebel Kitchen ‘Mylks’ below, however added to shakes/smoothies the subtle coconut flavour is absolutely lovely! 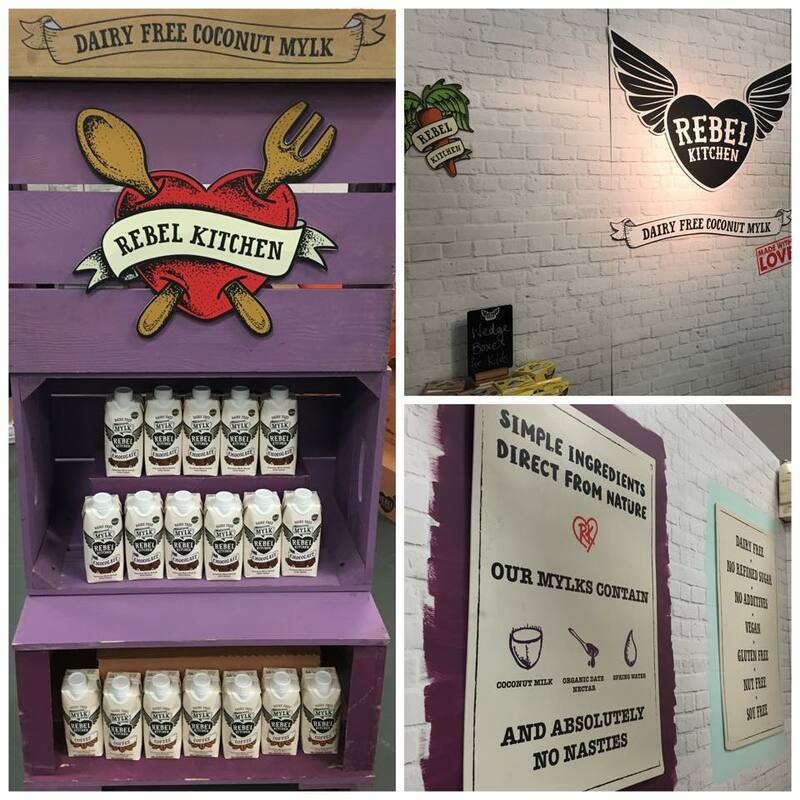 Rebel Kitchen first launched in January 2014, with an innovative range of flavoured coconut milks (or mylks, as they like to refer to them as). The brands mission is to create healthier, delicious tasting alternatives to everyone’s favourite (unhealthy) snack drinks. They are dairy, gluten, nut and soy free, with no refined sugar, additives or preservatives – suitable for Vegans, Vegetarians, or those following a Paleo diet! Aswell as this they are certified organic, non-GMO and kosher! The mylks are entirely made up of ingredients directly from nature: coconut milk (sourced from an island in Western Indonesia, via a local supplier who pride themselves on the welfare of their employees), Somerset spring water, organic date nectar, and (dependant on flavour) organic cacao/coffee/matcha green tea powder/Rainforest Allianca banana/Brazilian orange oil. This brand is one that seems honest, and with great branding that is on-trend, I was totally sold on this and will definitely be buying the product again! 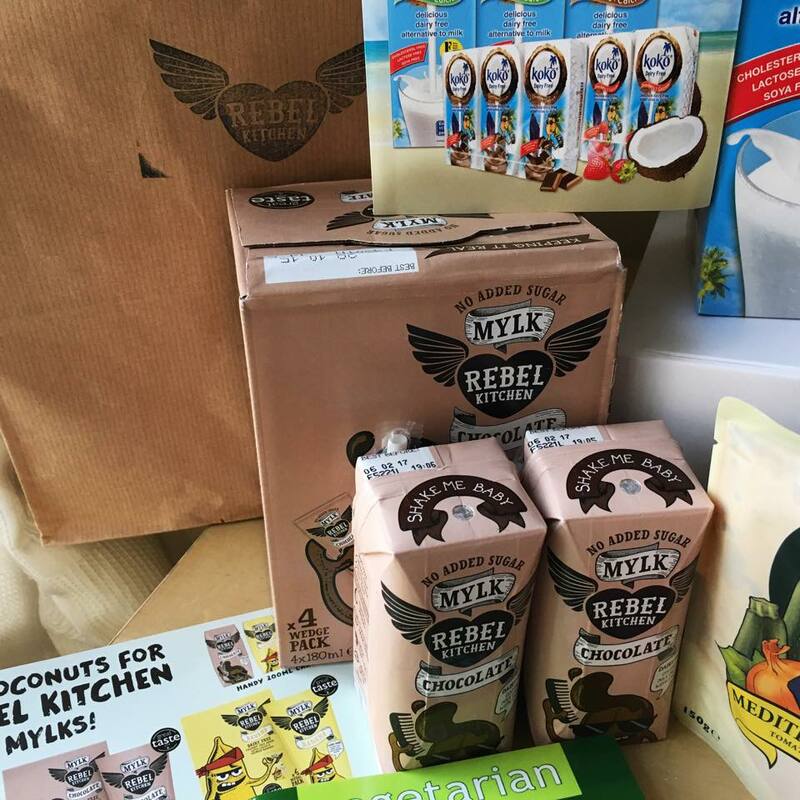 The small “Little Rebels” cartons I picked up at Vegfest cost £1.50 for 2 and the box of 4 “lunchbox format” mylks I was kindly given for free (RRP £3.19 for 4 x 180 ml box – available at Tesco), along with a press release which is how I know all of the above in depth information. The mylks are available at Wholefoods, Holland & Barrett, Ocado, Tesco, Waitrose, and Selfridges (to name a few)! They taste absolutely uh-maz-ing, I would highly recommend buying one sometime. They are the perfect healthy treat if you’re in the mood for something sweet! Okay, so this brand is one I already had the pleasure of meeting a few weeks prior at a blogger food event! I loved the meat free steaks so much I kept popping back for more samples, so when I saw they were doing £5 wraps for lunch (including tofu mayo, spicy sauce and salad) I had to get in on that! 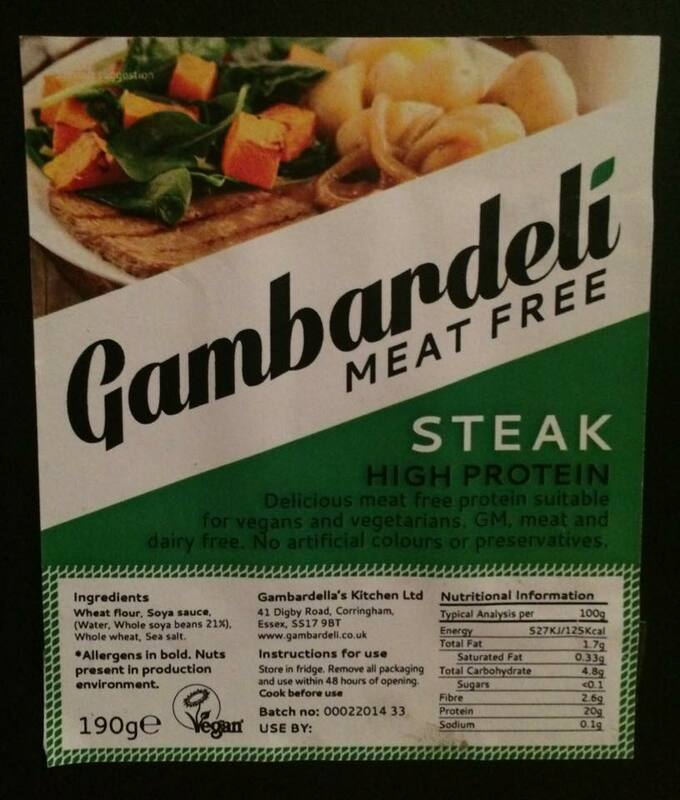 They were selling packets of the “steaks” for £5 aswell, so I stocked up and am excited about using my pack in the freezer one day soon. After posting about it on my personal Facebook page I did get a little bit of negativity from someone, so for full disclosure and to prove how there are no chemicals/artificial ingredients in the “steaks”, the ingredients are below! I am an absolute Quinoa fiend. If you’ve not tried it, it’s like nutty cous cous, that’s gluten free and just generally way better for you! You can get numerous different types and flavours and add the grains to pretty much anything! I thought I would throw in 2 little meal pics, of ways I’ve used Quinola Mothergrain since buying the pouches! First up, I made this Vegan deliciousness for dinner last week using the “KIDS Mediterranean pouch”. I cooked some Leek in coconut oil before adding the quinoa packet to the pan to heat up, and then served with a dollop of smushed up avocado (including a squirt of Sriracha Sauce for good measure) and fresh rocket on the side. This weekend I was staying in a big “party house” with a whole load of my extended Juice Plus team, and I took the split pea packet with me. So second up is the lunch I made on Saturday after popping Morrisons for some leaves and veg, and it took me all of about 30 seconds to make! Honestly, this chocolate was sooo tasty. I think there’s so much taboo around “Vegan” and “Healthy” chocolate, people are always so quick to write it off… But don’t do that right now plz, because this stuff tastes real good! After looking at the leaflets on the stall I learnt something: did you know that cacao beans which all chocolate is made from are full of nutrition containing over 300 active natural chemical compounds? (I did not!) Usually when chocolate is processed, the cacao beans are roasted to develop their flavour, but that also reduces the healthy properties, such as antioxidants and other heat-sensitive compounds… All the Raw Chocolate Shop sells is Raw Chocolate with Raw Cacao. Dooo you know what all of this means? 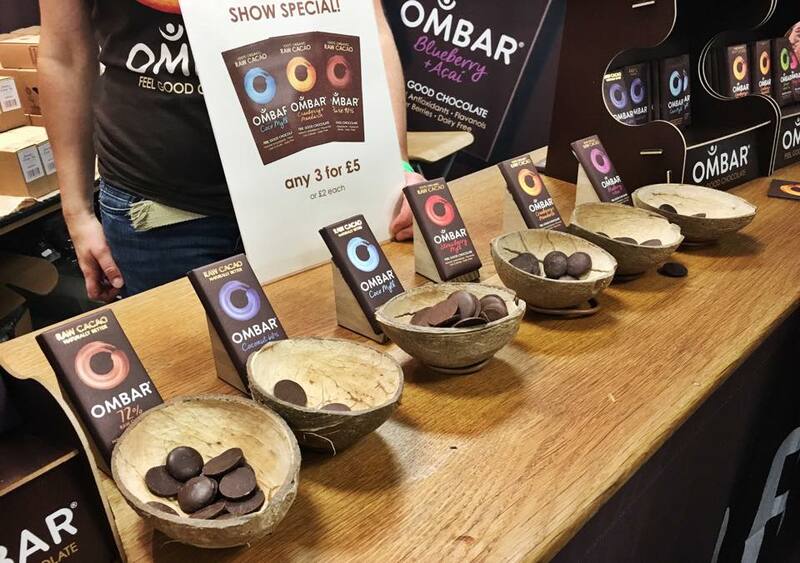 BASICALLY, Ombar chocolate is good for you!! Go forth and buy… Use the code ‘hello-choc’ for 10% off at the Raw Chocolate Shop checkout! Okay no beating around the bush here, these Pudology desserts were absolutely perfect, and a little bit indulgent without all of the guilt from a dairy heavy cream dessert! Smooth and creamy, yet somehow Vegan!? Absolutely must try if you see them next time you’re food shopping! 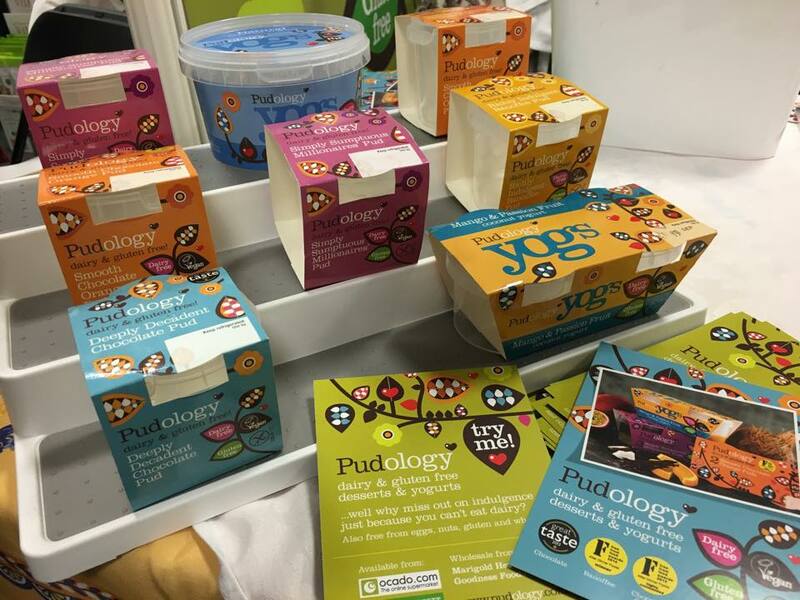 They are available from Ocado, Holland & Barrett, Waitrose, Selfridges & Co and some other Independent stores. Eat Kind is a new campaign from the Humane Society International. The campaign is to encourage people to eat kindly, taking into account animals. You can pledge to “eat kind” on their website – whether it’s “Meat-free Monday” or “Tofu Tuesday”, you can help the world become a place that’s kinder to animals. At Vegfest London they were giving out leaflets, with suggestions on how people could transition without it being too much of a shock. Check out Veggie Places and Happy Cow for info local to you, travel tips and global restuarant guides. TeenVGN is a not-for-profit Social Network and Support Group for compassionate young people (age 12-19). 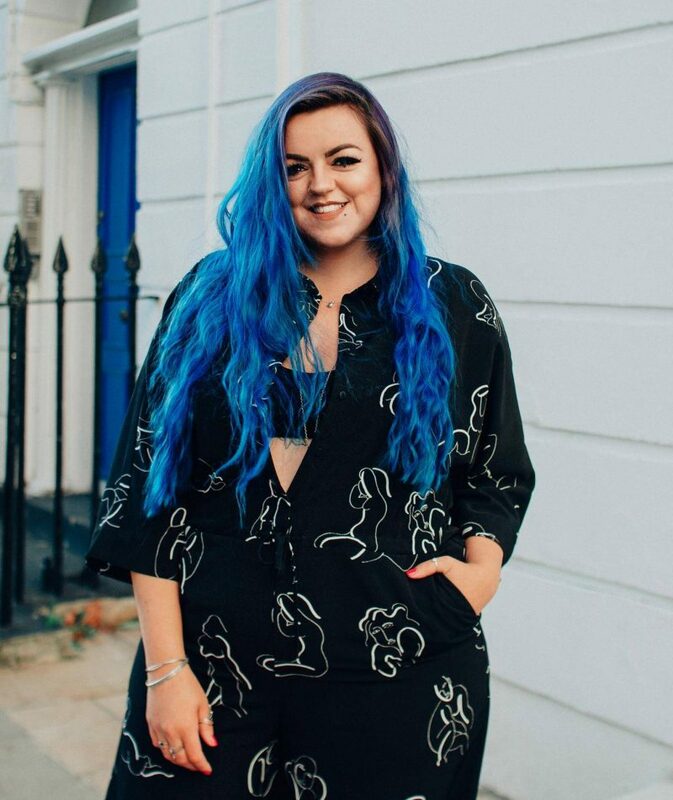 On their website you can find forums, blogs and vlogs to chat and connect with other likeminded people. Their mission is to create a safe and secure network for young Vegetarians and Vegans, aiming to build them up to become enthusiastic advocates for animals! I liked the look of this stall as soon as I saw it, it was colourful and a little higgildy piggildy (are those real English words? I’m not even sure at this stage), the ladies working there were smiley and friendly and I was instantly drawn to the “Avocado Addicts Anonymous” t-shirt straight away! As I don’t wear t-shirts all that often I was pleased to see there were badges and stickers too! I’ve not decided what to do with these yet, but they are available online, check out the other fun little trinkets available! First of all, it’s pronounced Vee-gan-uary (whilst there, Lissa and I came up with all kinds of pronunciations, some a little inappropriate – I’ll let you guess what that could be)… The general idea is that similarly to “Sober October” (no drinking for the month of October), or Movember (growing a moustache and not shaving during the month November) you go Vegan for the month of January! A new years resolution perhaps? Also helping to get rid of all those toxins consumed over Christmas/New Year, and by doing it you would be helping to make a positive change to the world, whilst helping your own body, reducing the suffering of animals and helping the planet! They are a non profit organisation and have had a lot of success since launching in 2014 and is already changing lives around the world. You can find expert advice and information on their site, with answers to “Why Go Vegan?” question, providing lots of information on HOW to actually do it! My lovely friend Lissa, who has told me many times she couldn’t be Veggie/Vegan even made the point of suggesting she would try it, maybe even do some fund raising too? I think it’s a totally great idea and am 100% encouraging the idea. I think for me, as I’m already Vegetarian, I would like to be Vegan in 2016… I know it will be super hard to cut out cheese (which is the main non-Vegan part of my diet as I don’t drink milk or eat eggs), but I’m 97% sure I’m ready to give it a go! 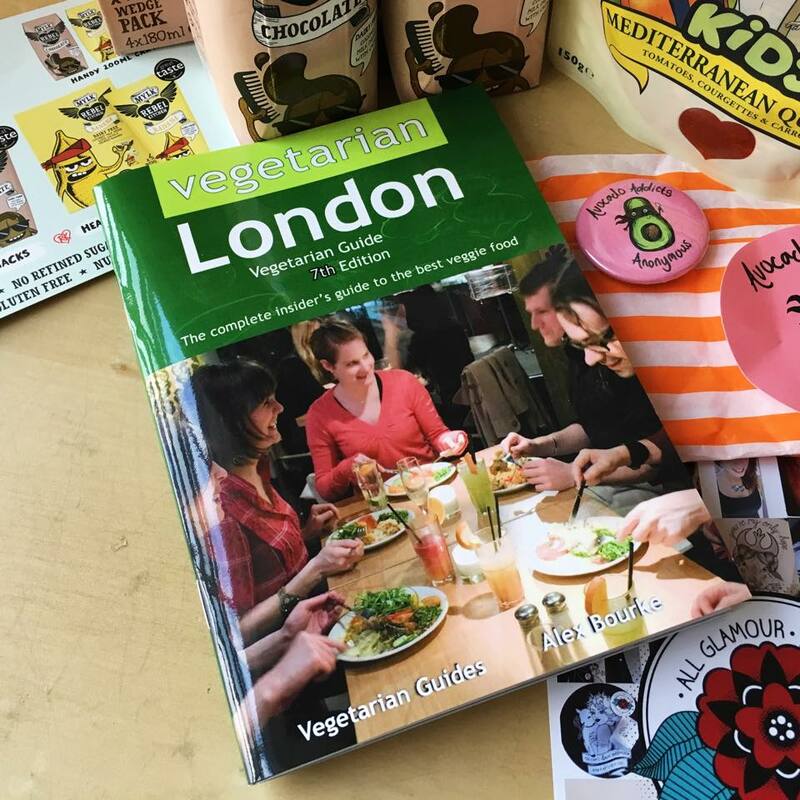 Pretty self explanatory… My colleagues will tell you that I often ask where are nice veggie places and most of them being meat eaters aren’t very helpful… So I was really excited about picking up this Vegetarian Guide for £5! Alex Bourke (the writer) told us that he had actually taken this to the printer the night before as he was at Vegfest London quite last minute. This is just a small section of a larger book of the best Veggie/Vegan places in UK! I’m really looking forward to trying some new places out in London! Okay, so this guy was hilarious. 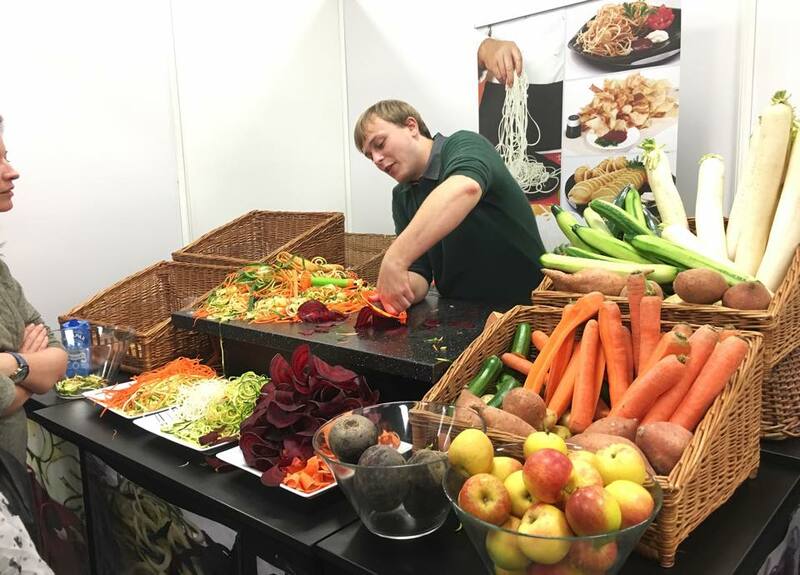 I only managed to take a quick snap on my walk by as we left and I’m unsure of the company, but he was showing Vegfest London how to use a spiralizer to a very captive audience. I have been wanting to try one of these for ageees. 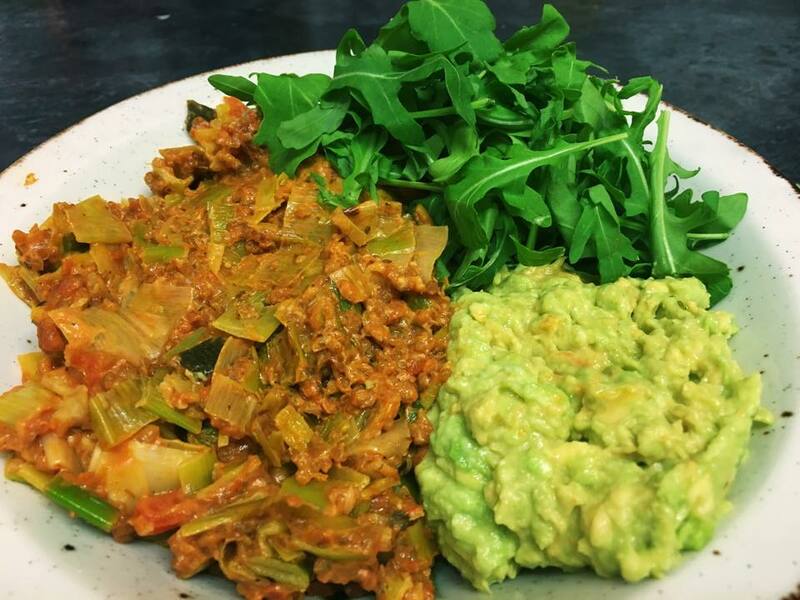 I’ve tried Courgette Spaghetti (Courgetti if you will) from the PURE in Soho when wanting a quick and healthy lunch, but would love to give it a go myself! Anyone tried one and have some advice on which brand would be good to try? 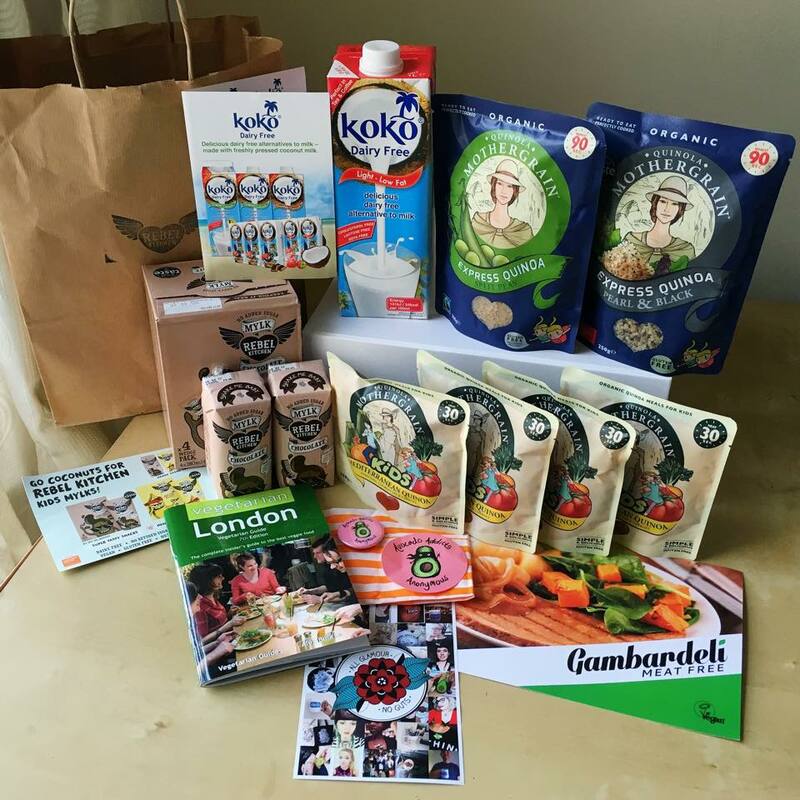 Other brands I spoke to included: Vegan Tuck Box “healthy, indulgent, sweet and savoury: our huge rand will satisfy anyone’s taste buds!” (use code ‘Tuck in’ for 20% off your first subscription box) and Fentimans – I’m a lover of their pink lemonade, its particularly nice as a mixer with alcohol and their stall was set up beautifully, couldn’t resist taking a picture! Another company definitely worth checking out is Dee’s Wholefoods: delicious Vegan sausages, burgers, & veg/quinoa pots! Sadly, due to only being there fer a few hours on one of the day I didn’t get a chance to look at all of the stalls, or make it up to the third floor, where there were speakers, and performers! But hopefully from this post you’ve got a little bit of a taste of how awesome my Vegfest experience was, and it has inspired you to head down to one sometime! Hopefully this epic post has inspired you to try something new, or go the kitchen and make something fresh, tasty and dairy free! 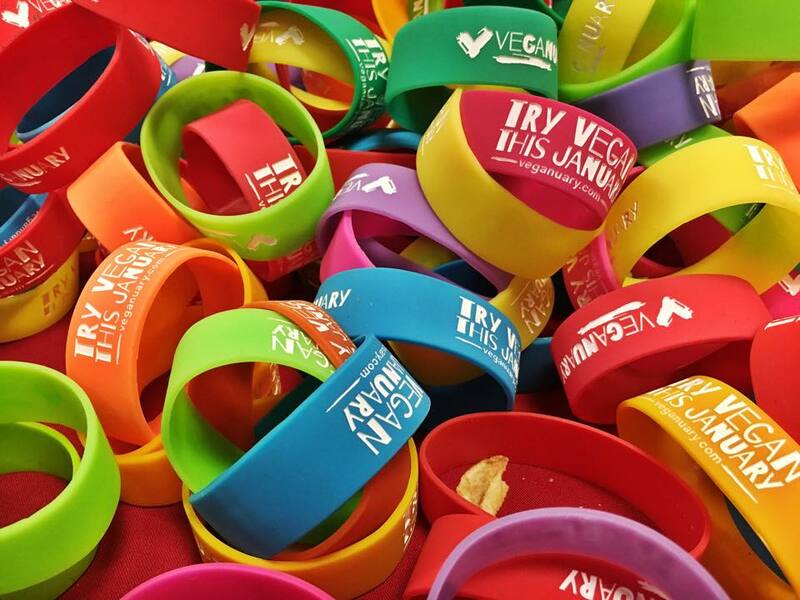 If you’re a omnivore, perhaps you fancy trying Veganuary like Lissa (Girl At The Rock Show) is doing in 2016? And fiiinally, a massive well done is needed if you made it to the end of this one, it got pretty long by accident, there were just so many great companies I wanted to talk about, I couldn’t help myself! Iwould love to hear from others that ventured down there, what brands did you love? Are there any awesome companies I should make sure I check out next time? P.s. 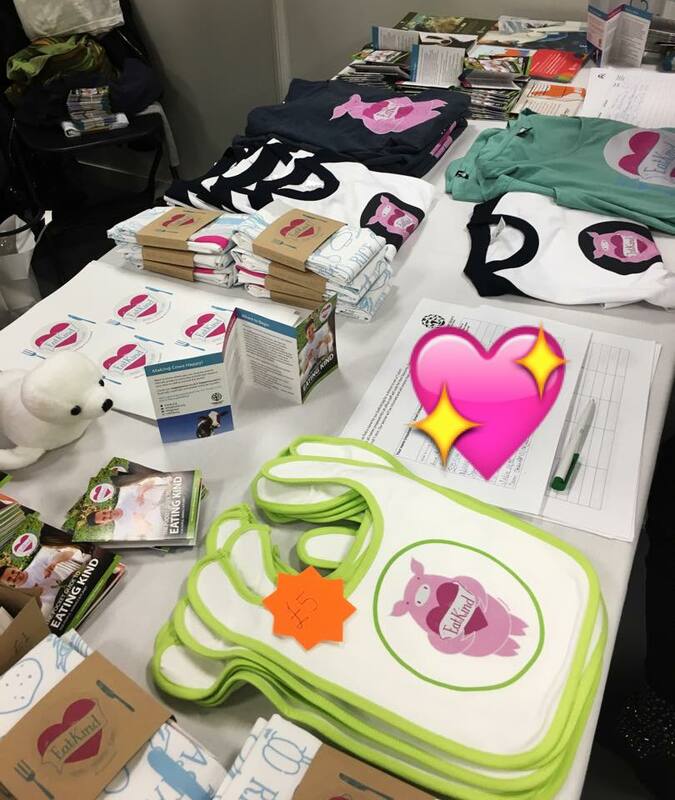 If you’re in Scotland, check out Vegfest Glasgow on 5th & 6th December! 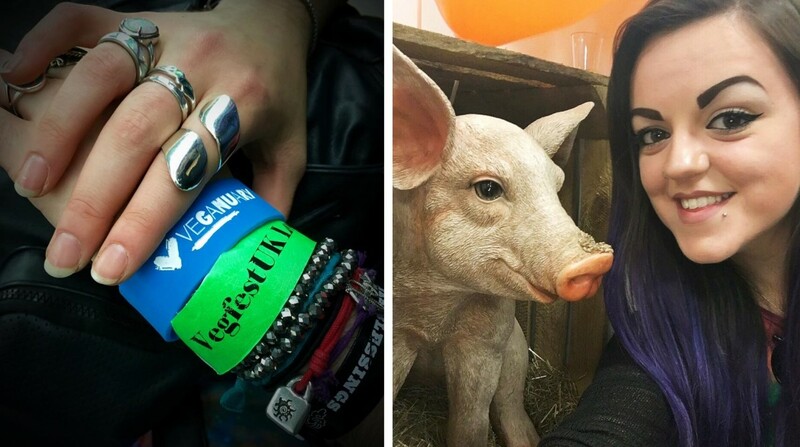 You can also find out about all upcoming 2016 Vegfest events (once they’ve been announced) on their website! It looks like it was fun. I would love to visit it, but it’s far from me (I’m in Liverpool). I have that spiralizer, I bought one from BBC Good Food Show and it’s hard to use. The bigger ones must be easier to use and the price is similar. I love making courgette pasta, it’s easy and it takes only a few minutes to cook. I will buy a regular spiralizer to replace the that I have pretty soon.